Cryopreservation is the process of preserving living systems by freezing them and storing them at ultra-low temperatures, usually in liquid nitrogen (-196°C) or its vapor phase (-150-195°C). The method is increasingly used to conserve crops that do not produce seeds (such as banana), do not breed true from seeds (e.g. potato, onion) or have seeds that are desiccation- or chilling-sensitive and therefore cannot be safely conserved in a dried state in genebank cold rooms (e.g. most tropical fruit trees). Traditionally, these crops are maintained as plants in the fields in potentially vulnerable conditions exposed to pests, deceases and environmental fluctuations. To mitigate those risks, some crops can be conserved in in vitro genebanks. Yet in vitro conservation is cost- and labor-intensive and requires regular material transfer to a fresh growth media. Another challenge is the risk of somaclonal variation: spontaneous mutations caused by artificial growth conditions and some chemicals added to the growth media. Cryopreservation offers a cost-effective way to reduces those risks by conserving plant material at ultra-low temperature that suppresses molecular motion, metabolic and biochemical reactions thus achieving a “suspended animation” state in the samples. Generally, there are very few biologically significant reactions or changes that occur in the cryopreserved material which leads to high level of genetic stability over the long-term conservation period. Cryopreservation generally requires a significantly smaller space than other conservation methods and has limited needs for monitoring. Cryobanks can therefore provide an important opportunity for secure back up field and tissue culture collections and their rationalization. Since the first experiments of cryopreserving seeds at the end of 19th century, cryopreservation of plant germplasm has advanced significantly. But there is a huge scope for further development and mainstreaming of cryopreservation protocols to include more genotypes and species. Being an advanced method of conservation, cryopreservation requires extensive knowledge of plant stress physiology, well-developed infrastructure and skillful personnel. 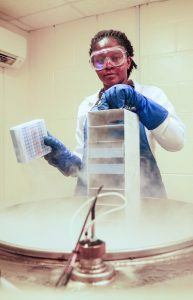 This level of infrastructure and expertise exists in CGIAR genebanks, where cryopreservation is routinely implemented to conserve collections they hold in trust: banana and plantains, potato, sweetpotato, cassava and yams. Some data on the collections cryopreserved in these genebanks is presented below. Most of these crops have been cryopreserved using shoot tips of in vitro plants and droplet-vitrification method adapted for each crop. In addition, IITA is working on implementing V-cryoplate method for cryopreservation of cassava. Implementation of cryopreservation to valuable crops is an important component of the Genebank Platform. Cryopreservation has been increasingly used to eradicate plant pathogens that cannot be removed by other methods. This process, knows as “cryotherapy”, refers to short-time liquid nitrogen treatment of shoot tips excised from the infected materials. Whilst cryopreservation kills the cells invaded by the pathogen, smaller and denser cells of the meristematic region survive and, upon rewarming and recovery, give rise to a plant which is pathogen-free. Cryotherapy, alone and in combination with other therapies, has been successfully applied to eradicate a number of viruses, phytoplasma and bacteria from various crops including banana, cassava, potato, sweetpotato, and yam. Combination of cryotherapy and meristem culture is used in CIAT to cure cassava accessions from cassava common mosaic virus (CCMV) and a Reovirus associated with cassava frog skin disease (CFSD). Standard for cryobanks can be found on pages 139-149. ISBER. 2018. Best practices for repositories: collection, storage, retrieval and distribution of biological materials for research, 4th Edition. Developed and regularly updated by ISBER, this document presents the best practices for repositories that can be used as guidelines and adopted for plant cryobanks. Acker JP, Adkins S, Alves A, Horna D, Toll J. 2017. Feasibility study for a safety back-up cryopreservation facility. Independent expert report: July 2017. The document presents the analysis of the worldwide status of cryopreserved collections of crops listed in Annex 1 and Article 15 of the International Treaty on Plant Genetic Resources for Food and Agriculture based on data received from 19 international and national institutions and laboratories, recent advances in protocol development and cost comparison between field, in vitro and cryopreserved collections for the selected crops. Vollmer R, Ellis D and Anglin N. 2017. Evolution of Quality Standards in plant cryobanks – The International Potato Center as a case study. Conference paper. The 54th Annual Meeting of the Society for Cryobiology, Hefei, China. A comprehensive practical guide with review chapters and working cryopreservation protocols for many plant species and different types of materials. Pritchard HW, Nadarajan J, Ballesteros D, Thammasiri K, Prasongsom S, Malik SK, Chaudhury R, Kim HH, Lin L, Li WQ, Yang XY, Popova E. 2017. Cryobiotechnology of tropical seeds – scale, scope and hope. Acta Horticulturae 1167: 37-48. Vollmer R, Villagaray R, Egusquiza V, Espirilla J, García M, Torres A, Rojas E, Panta A, Barkley NA, Ellis D. 2016. The potato cryobank at the International Potato Center (CIP): A model for long term conservation of clonal plant genetic resources collections of the future. CryoLetters 37: 318-329. Popova E, Shukla M, Kim HH, Saxena PK. 2015. Plant cryopreservation for biotechnology and breeding. In: Al-Khayri JM et al. (Eds) Advances in Plant Breeding Strategies: Breeding, Biotechnology and Molecular Tools. Springer, Switzerland, pp. 63–93. Wang B, Wang RR, Cui ZH, Bi WL, Li JW, Li BQ, et al. 2014. Potential applications of cryogenic technologies to plant genetic improvement and pathogen eradication. Biotechnol Adv 32:583–95. Panis B, Lambardi M. 2006. Status of cryopreservation technologies in plants (crops and forest trees). In: Ruane J, Sonnino A, editors. The role of biotechnology in exploring and protecting agricultural genetic resources. Food and Agriculture Organization of the United Nations, Rome, Italy: 61-78. Volk GM, Walters C. 2003. Preservation of genetic resources in the national plant germplasm clonal collections. Plant Breeding Reviews 23: 291-344. Volk GM, Henk AD, Jenderek MM, Richards CM. 2017. Probabilistic viability calculations for cryopreserving vegetatively propagated collections in genebanks. Genet Resour Crop Evol 64:1613–1622. Panis B. 2009. Cryopreservation of Musa germplasm: 2nd edition. Technical Guidelines No. 9 (F. Engelmann and E. Benson, eds). Bioversity International, Montpellier, France. Escobar RH, Muñoz L, Rios A, Núñez A, Tohme J. 2014. Using a droplet vitrification method to partially overcome the recalcitrance of cassava to cryostorage. Acta Horticulturae 1039: 227–232. Charoensub R, Hirai D, Sakai A. 2004. Cryopreservation of in vitro-grown shoot tips of cassava by encapsulation-vitrification method. CryoLetters 25: 51–58. Escobar RH, Mafla G, Roca WM. 1997. A methodology for recovering cassava plants from shoot tips maintained in liquid nitrogen. Plant Cell Reports 16: 474–478. Escobar R, Roca WM. 1997. Cryopreservation of cassava shoot tips through rapid freezing. African J Root Tuber Crops 2: 214–215. Adu-Gyamfi R. 2011. Safeguarding cocoa (Theobroma cacao L.) germplasm by cryopreservation: the vitrification approach. PhD Thesis. University of Reading, UK. CacaoNet. 2012. A Global strategy for the conservation and use of cacao genetic resources, as the foundation for a sustainable cocoa economy (B. Laliberté, compiler). Bioversity International, Montpellier, France. Fang J-Y, Wetten A, Hadley P. 2004. Cryopreservation of cocoa (Theobroma cacao L.) somatic embryos for long-term germplasm storage. Plant Science 166: 669–675. Vollmer R, Villagaray R, Cárdenas J, Castro M, Chávez O, Anglin NL, Ellis D. 2017. A large-scale viability assessment of the potato cryobank at the International Potato Center (CIP). In Vitro Cellular & Developmental Biology – Plant 53: 309-317. Niino T, Arizaga MV. 2015. Cryopreservation for preservation of potato genetic resources. Breeding Science 65: 41-52. Kaczmarczyk A, Rokka VM, Keller ERJ. 2011. Potato shoot tip cryopreservation. A review. Potato Res 54: 45–79. Sant R, Panis B, Taylor M, Tyagi A. 2008. Cryopreservation of shoot-tips by droplet vitrification applicable to all taro (Colocasia esculenta var. esculenta) accessions. Plant Cell, Tissue Organ Culture 92: 107–111. Takagi H, Thinh NT, Islam OM, Senboku T, Sakai A. 1997. Cryopreservation of in vitro-grown shoot tips of taro (Colocasia esculenta (L.) Schott) by vitrification. 1. Investigation of basic conditions of the vitrification procedure. Plant Cell Reports 16: 594–599. Gonzalez-Arnao MT, Engelmann F. 2006. Cryopreservation of plant germplasm using the encapsulation-dehydration technique: review and case study on sugarcane. CryoLetters 27: 155-168. Dulloo E, Ebert AW, Dussert S, Gotor E, Astorga C, Vasquez N, Rakotomalala JJ, Rabemiafara A, Eira M, Bellachew B, Omondi C, Engelmann F, Anthony F, Watts J, Qamar Z, Snook L. 2009. Cost efficiency of cryopreservation as a long-term conservation method for coffee genetic resources. Crop Science 49: 2123–2138. Kim HH, Popova E, Shin DG, Yi JY, KimCH, Lee JS, Yoon MK, Engelmann F. 2012. Cryobanking of Korean Allium germplasm collections: results from a 10 year experience. CryoLetters 33: 45–57. Benelli C, de Carlo A, Engelmann F. 2013. Recent advances in the cryopreservation of shoot derived germplasm of economically important fruit trees of Actinidia, Diospyros, Malus, Olea, Prunus, Pyrus and Vitis. Biotech Adv 31: 175-85. Towill LE, Forsline PL, Walters C, Waddell JW, Laufmann J. 2004. Cryopreservation of Malus germplasm using a winter vegetative buds method: results from 1915 accessions. CryoLetters 25: 323–34.